What might happen when an impoverished couple has twin boys in the midst of the depression? In the plot of The Identical, they give one boy to their preacher and his wife and raise the other themselves. They bury an empty shoe box to give credence to their lie that the other twin died. 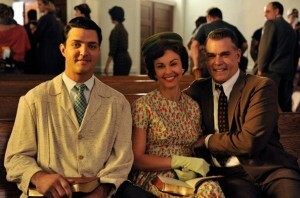 Ryan Wade (Blake Rayne, left) and his adopted parents (Ashley Judd and Ray Liotta) attend church together. It doesn’t take a Sherlock Holmes to know the plot is a riff on the possibilities of Elvis Presley’s life if his stillborn twin brother had lived. In the movie, Drexel Hemsley (Blake Rayne) the child the parents kept grows up to be a huge success in rock ‘n’ roll. The twin, Ryan Wade (also Blake Rayne) grows up to be a straight-arrow preacher’s kid who has a good voice. Ryan and his wife Jenny (Erin Cottrell) struggle and he takes a job with a mechanic (Joe Pantoliano) but he always has a yearning to be a performer just like his favorite singer, Drexel Hemsley. About halfway through the movie, Ryan enters a contest for Drexel imitators. He wins, of course (never any doubt of that), but it is at the contest that Drexel gets to see his (still unbeknownst to him) twin brother. He indicates approval and, at the contest, a promoter offers Ryan a job touring as “the identical,” doing a Drexel Hemsley act. As the brothers, Blake Rayne, who actually works as Ryan Pelton, a real-life Elvis tribute artist, is clearly good at “being” Elvis. The music is original for the film and it is completely in the spirit of the 1950s stuff that made Elvis famous. Rayne has a good voice and the Elvis look. I believe The Identical is getting a bad rap from critics. At one point it was being sold as a Christian film. Yes, the characters in it are Christian and they do (some of them) go to church. But that doesn’t make it a “Christian” film. I found it fun, melodramatic and different from what we’ve seen. Ray Liotta, as Reece Wade, the preacher who adopts Ryan, is a revelation. We’ve never seen him like this and, at the screening I attended, several people talked of him being nominated for an Oscar. Well, you should, of course, make up your own mind and, I think, you’ll have fun doing so.